In public debate, progressives and conservatives often seem poles apart. Yet, behind the scenes, when pragmatic reformers take on a problem, their conclusions often converge, regardless of their political starting points. The Medicare Extra proposal recently released by the Center for American Progress (CAP) is a case in point. Filtering out any ideological language, Medicare Extra bears a strong resemblance to universal catastrophic coverage (UCC), an approach to healthcare reform that originated in conservative circles, but is now attracting wider attention. This post compares the two side by side. The CAP bills Medicare Extra as an enhancement of traditional Medicare that would ensure that all Americans have healthcare coverage they can rely on at all times. It would cover a broad spectrum of healthcare needs, including dental, vision, and hearing care. Newborns, the currently uninsured, and people turning 65 would be enrolled automatically, while those who now have public or private coverage would have the option of enrolling. In those respects, as well as in its name, Medicare Extra bears a strong resemblance to Senator Bernie Sanders’ Medicare for All. However, whereas Sanders’ plan would provide first-dollar coverage of healthcare spending for everyone, Medicare Extra builds in a substantial amount of cost sharing. Individuals and families with incomes below 150 percent of the federal poverty level (FPL) still get first-dollar coverage, but those with higher incomes would pay premiums according to a sliding scale that reached 10 percent of income for households at 500 percent of the FPL. Middle- and upper-income families would, in addition, face deductibles and copays. Those would be structured to give Medicare Extra policies an “actuarial value” sufficient to cover 80 percent or more of a household’s expected healthcare costs—the same standard of coverage as a gold plan purchased on today’s ACA exchanges. UCC takes a similar approach to cost sharing. There are many versions, but for the sake of comparison, we can use a proposal by Kip Hagopian and Dana Goldman, recently outlined in Forbes. That plan would issue everyone a health insurance policy with a deductible equal to 10 percent of their “discretionary income,” that is, the amount by which their income exceeded the federal poverty level. The maximum deductible would be twice that amount for families of two or more. In the simplest case, the catastrophic policy would pay all medical expenses once the deductible was met. People with incomes over 300 percent of the poverty line would also be required to pay a premium, estimated to be about $3,200. Some versions of UCC envision an additional tier of income, say another 10 percent, in which a copay would be required, but we do not consider copays here. Both Medicare Extra and UCC would make special provisions for covering essential preventive services free or at reduced rates. With that exception, they would provide fully prepaid care only to those with very low incomes. Everyone else would be responsible for a significant, but affordable, share of their annual healthcare costs. 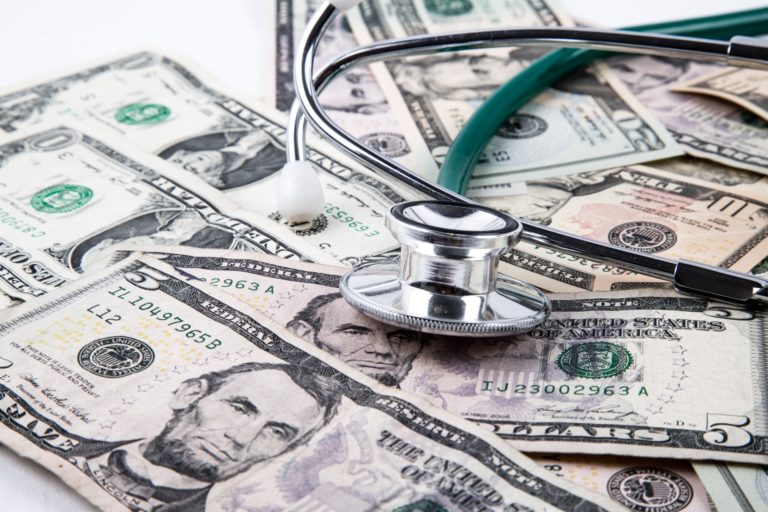 They could meet those costs in cash, by making withdrawals from health savings accounts, or with some form of private supplemental insurance, as they chose. A family consists of two adults and two children. The federal poverty level is $25,000 for that family. The columns for moderate family expenses include premiums and out-of-pocket expenses based on annual use of $1,000 worth of services by each family member. That is about 10 percent of the national per capita mean for personal healthcare expenditure. Given the highly skewed distribution of spending, I estimate it to be close to, or a little above, the median. For UCC, the columns for maximum family expenses include the premium and assume that two or more members of the family meet or exceed the deductible. For Medicare Extra, they include the premium plus the family maximum out-of-pocket cost. For Medicare Extra, for incomes of 500 percent of FPL and up, I use a hypothetical plan with 80 percent actuarial value that has an annual premium of $12,500 (10 percent of an income of $125,000), a deductible of $1,000, and a 20 percent copay, up to an out-of-pocket family maximum of $10,000. Those parameters are based on a representative ACA gold plan. For low- and moderate-income families, the two plans produce similar results: Full coverage for the poor and near-poor, and substantial but affordable expenses for the middle class. It would be easy to tweak the values used for premiums, deductibles, and copays to make the two plans even more similar for low- and middle-incomes. For incomes over 500 percent of the FPL, maximum expenses under the UCC and Medicare Extra plans appear to diverge. Paradoxically, the “progressive” Medicare Extra gives a bigger break to high-income families than the “conservative” UCC plan. However, the difference is at least partly illusory, since the CAP calls for financing Medicare Extra largely through tax surcharges on high-income individuals. If we lumped those taxes together with the explicit premiums, the amount of cost-sharing for high-income families under Medicare Extra would be much larger. Despite the many similarities, there are some significant differences between Medicare Extra and UCC. One is the way the two programs are financed. UCC keeps premiums down by having very high deductibles. Some versions of UCC keep premiums even lower by adding co-pays, up to some maximum out-of-pocket limit. Some versions dispense with premiums altogether. By comparison, Medicare Extra has lower deductibles and lower family maximums, but higher premiums, and has dedicated taxes on top of those. One result of the different financing mechanisms is that Medicare Extra spreads the risk of healthcare expenses more evenly among members of a given income bracket, regardless of their health status. In that regard, it is more insurance-like. A program like UCC, with high deductibles, is less expensive for wealthy-but-healthy households, and costlier for wealthy-but-unhealthy ones. In a way, that seems fairer, but remember, the difference is large only for the very rich. Do we really have to shed tears if a family with an annual income of a million dollars has to spend $200,000 a year for healthcare? After all, that still leaves them with $800,000 to spare. If you view insurance primarily as a way of protecting families against financial catastrophe, the distributional differences between the two programs may not matter much. Perhaps more importantly, the different financing mechanisms reflect different strategies for cutting total national healthcare spending. At 18 percent of GDP, healthcare spending in the United States is currently the highest in the world. Many conservative reformers blame high costs on the fact that healthcare consumers are, too often, spending someone else’s money. They maintain that if people had more “skin in the game,” in the form of high deductibles and copays, they would spend their healthcare dollars more wisely. Smarter consumer behavior, in turn, would unleash market forces that would put downward pressure on healthcare costs. Just how large the savings would be is a matter of some controversy. Compare, for example, the relatively optimistic assessment from RAND with the more skeptical take from the Kaiser Family Foundation. The amount of cost reduction from any market-based plan would depend, in part, on measures to facilitate wise consumer choice, such as greater price transparency and removal of barriers to competition and entry of new providers. Although Medicare Extra, too, expects people to make substantial contributions to the cost of their healthcare, more of those contributions come from premiums, which do not affect spending decisions at the margin. Modest deductibles and co-pays would still give some incentive to shop carefully, but not nearly as much as under UCC. Instead of skin in the game, Medicare Extra, as outlined by CAP, would rely more heavily on direct regulation of reimbursement rates and drug prices. The plan also hopes to achieve significant savings in administrative costs. Although this review has been generally positive, CAP’s plan has some weaknesses. In particular, it is far too timid in attacking the fragmentation of the U.S. healthcare system. Although it offers everyone the option of enrolling in Medicare Extra, it leaves original Medicare, Medicare Advantage, employer coverage, TRICARE (for active military), Veterans Affairs medical care, the Federal Employees Health Benefits Program, and the Indian Health Service largely intact. In my view, that would seriously undermine the hope that Medicare Extra could realize significant cost savings. It seems wasteful to maintain multiple administrative bodies for separate programs, many of which are already small, and would become smaller still if, as would be likely, some of their current beneficiaries took up the option of switching to Medicare Extra. Furthermore, it seems that coordinating reimbursement rates and negotiating drug prices would be a nightmare with so many administrators in the game. Even worse, Medicare Extra appears to envision indefinite continuation of employer-sponsored insurance (ESI). ESI, born by accident during World War II, is the original sin of the U.S. healthcare system. No other country has ever adopted anything like it. ESI further fragments an already fragmented system, distorting healthcare choices and raising administrative costs. It is seriously inequitable, lacking equal treatment both across employers and among employees of a single company. Furthermore, it is a source of “job lock” that undermines labor mobility at a time when we need even more labor market fluidity to react to trade and technology shocks. It is hard to say enough bad things about ESI, and hard to think of any reason why replacing it either with Medicare Extra or with UCC would not be a good idea. Many smart health care observers thought that large companies would dump their workers onto the Obamacare marketplaces, where the federal government would subsidize their premiums rather than the employer. But that didn’t happen, and we saw that employers were quite reticent to disrupt their workers’ coverage. Could it be that employers actually like job-lock? That is said to be the rationale behind the proliferation of noncompete clauses for low-wage workers and other abusive strategies that encourage monopsony in labor markets. Employer-sponsored health insurance seems to fit the pattern. Theoretically, UCC could also be introduced in a way that left ESI untouched, but that is not what most of its proponents envision. For example, in a 2012 article in National Affairs, Hagopian and Goldman note the “virtual unanimity” among economists that the tax exclusion for health insurance is bad public policy, and is “an important part of the reason for the inefficiency of our health-care system and for the high number of uninsured.” They propose that UCC should replace the catastrophic portion of all employer-sponsored insurance, although they would allow employers to provide supplemental, non-catastrophic coverage if they chose to do so. In principle, there is no reason that Medicaid and conventional Medicare, too, could not be rolled into UCC. UCC and Medicaid are close substitutes, in that both offer first-dollar coverage at no cost to families in or near the poverty level. In replacing Medicare with UCC, careful thought would have to be given to the treatment of retirement income and savings for purposes of setting deductibles. One solution would be simply to assign a uniform and low deductible to everyone after a certain age, as Medicare now does. Both plans agree on the goal of providing universal, affordable access to the healthcare system. Both agree that doing so will require some form of first-dollar coverage for people at the lowest income levels. Both agree that the middle class can and should make a substantial contribution to routine healthcare needs, and that they could afford to do so, given a safety net against medical catastrophes. Both agree that upper-income households should make a larger financial contribution, whether through premiums, high deductibles, taxes, or some combination. Both agree that reform of the way healthcare is paid for will be more successful if it is combined with intelligent reform of pricing, competition, and administration. Within these shared principles, there is a genuine opportunity for negotiation and compromise among would-be reformers from all parts of the political spectrum.